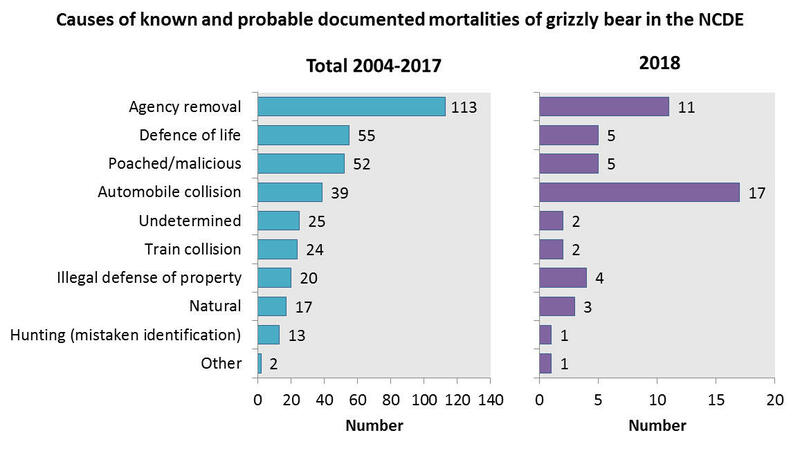 Known and probable documented mortalities of grizzly bears in the NCDE from 2004 to 2018. "It was 51 total mortalities, those include both known and probable mortalities." When she says “probable mortalities,” Costello means she figures in some bears that were never actually found, like two cubs that were hit by a driver, who was certain they couldn’t survive their injuries. But officials were never able to locate the bodies. 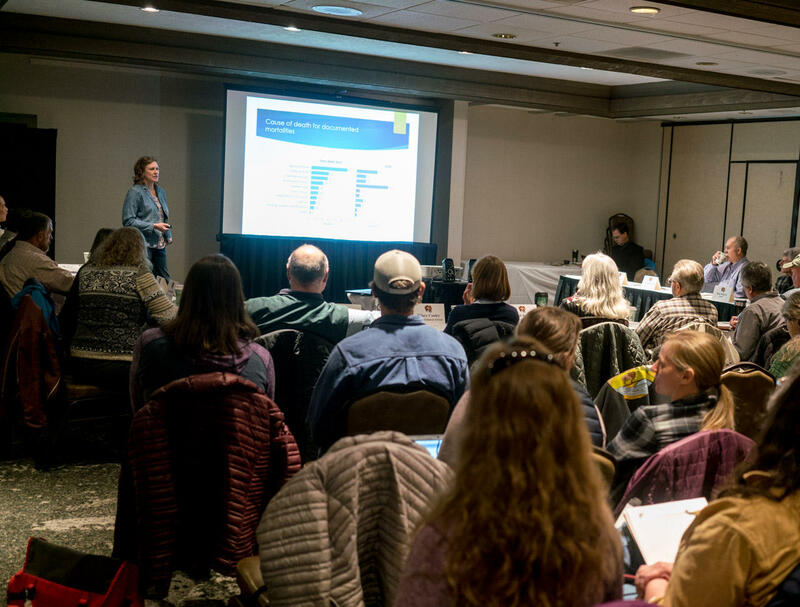 Cecily Costello, a grizzly bear research biologist for Montana Fish, Wildlife and Parks, presenting at an annual meeting Tues., Nov. 20 on grizzlies in the Northern Continental Divide Ecosystem. And 51 mortalities doesn’t mean 51 dead bears. For scientists, a mortality is any grizzly that leaves the ecosystem. She says five bears were relocated this year. One went to the Cabinet-Yaak area, three cubs went to a zoo in Canada, and a yearling bear went to the state of Washington. So that means at least 46 bears in the NCDE died this year. It’s a huge jump. That number has never gone above 35 in more than a decade. So the bottom line – what does this mean for the whole population? "I’m not worried, yet. For sure it’s a little unprecedented. But the numbers themselves are not alarming," Costello says. But others, like wildlife advocate Mike Bader, say the record-breaking year shows the state and federal government are being too lenient. "I think it shows that the population’s really vulnerable, that we don’t have adequate regulatory mechanisms – that they’ve kinda let their guard down on road management. And so as the rules get relaxed and more people visit, it’s just working against the bear." Bader has other concerns too: he’s worried about the large number of female bears that died this year, especially on roads. A healthy population of female bears of reproductive age is important to the species’ growth. And he also says high mortality rates mean fewer grizzlies that might wander outside the ecosystem on their own, and connect with other bear populations. Connectivity between the NCDE and other ecosystems is a key goal of grizzly recovery. "More mortality is not evidence of more bears," Bader says. "Mortality is evidence of more dead bears. And so that’s what we’ve gotta be concerned is that after 35-some years of progress towards bringing these bears back from the brink, that right now we could cut that rug right out from under them and waste all that time and effort." However, Costello says the state sets thresholds for bear mortality. According to a proposed state rule, they want to be 90-percent sure that there are at least 800 bears in the ecosystem – and there are also specific limits on independent male and female grizzly deaths. And this year grizzly mortalities are still well below those limits. "Even with the number of mortalities that we observed this year, we still believe that the population is continuing to grow and expand," Costello says. That state rule will be finalized next month, and will take effect when bears in the NCDE are removed from the endangered species list. But plans to do so have been stalled until after the end of the year. Federal officials believe the population here has recovered since grizzlies in the lower 48 were listed as “threatened” under the Endangered Species Act in 1975. Causes of known and probable documented mortalities of grizzly bear in the NCDE. This year, the majority of deaths in the ecosystem were human-caused, and Costello says the spike in mortality was largely driven by cars. Seventeen mortalities were from car accidents. In one night alone, five grizzlies died on roads on the Flathead Reservation. But she says there’s another force causing more grizzly deaths, too. "The population is growing. The population is expanding into more human-dominated landscapes. So it’s not unusual just from a numerical standpoint." Overall, bears die in lots of ways. In addition to cars this year, there was accidental hunting, self-defense, management removals for bears that got too used to people. A couple bears were hit by trains. One fell off a cliff in Glacier. One ate pesticide. But she says there’s a lot of uncertainty in these numbers too. When bears die naturally, they’re hard to find. The ones officials do locate tend to have radio collars. "We know that the reporting rate is not 100 percent for all causes of death, so when we apply that to the total number of documented mortalities, then we can estimate how many other bears died that weren’t reported." As a rule, Costello says they double the number of mortalities from bears that are older than cubs within the grizzly’s core habitat. That margin leaves room for nearly 80 bear mortalities this year. 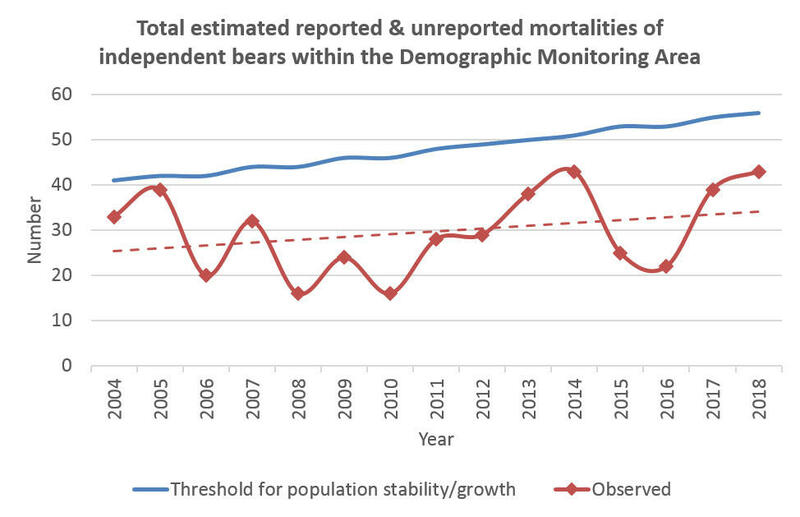 Total estimated reported and unreported mortalities of independent bears within the Demographic Monitoring Area. Costello says she’s hoping this number is just about final since bears are starting to den and hunting season’s nearly over. She says it’s tough to straddle the line between conservationists like Mike Bader and others who live with grizzlies and want fewer bears near their homes. "We’re hoping that over time we can have a level of tolerance for bears as they expand into some areas. But we recognize that grizzly bears can be difficult to live with, and so there has to be a little give and take." But Costello’s optimistic that we’ll have a future in which people and grizzlies get along. "We were on track to try and have a proposal, or at least have an evaluation of recovery and a potential proposal, out by the end of the calendar year," says Hilary Cooley, the grizzly bear recovery coordinator for the Fish and Wildlife Service, at an annual meeting Tuesday on grizzlies in what’s known as the Northern Continental Divide Ecosystem, or NCDE. A male grizzly bear cub was killed by a train near Columbia Falls last week, adding to the abnormally high number of bear mortalities in the Northern Continental Divide Ecosystem this year. In the last month two adult female grizzlies were also found dead, due to natural causes, near Hungry Horse. Montana Fish, Wildlife and Parks reports 48 bear mortalities this year. FWP labels any bear removed from an ecosystem as a mortality, so not all have died. Some are moved to another region or accredited zoo. Grizzlies in Northwest Montana are moving into areas they haven’t been seen in years, and Wednesday conservation organizations announced they’ve purchased a chunk of land near Troy that could help those bears continue to migrate and expand their territory. The Vital Ground Foundation and the Yellowstone to Yukon Conservation Initiative say they have now purchased the majority of an undeveloped subdivision near the confluence of the Kootenai and Yaak rivers. KALISPELL, Mont. (AP) — A Montana elk hunter who was attacked by a grizzly bear is recovering at a hospital. Anders Broste tells the Daily Inter Lake newspaper Monday that he thinks he surprised the bear Sunday morning.